Helen watches her former playmates from the window now. Not long ago she had mixed with the blond children outside, but now she is considered the enemy. Words like Nazis and dirty Jews were becoming more and more common, with little to no explanation from her mother. Father’s book store was closed and food was sparse. Feeling like a caged bird, Helen was no longer allowed to attend school or go outside. Mother kept the windows closed most days for inexplicable reasons of safety, shutting out Helen’s beloved clouds. One day Mother told Helen to pack a bag with her most special possessions. She excitedly told Helen that she would be leaving on an adventure. Her application had been accepted for Kindertransport to England, where she would live safely with a British foster family until the imminent danger of war vanished. 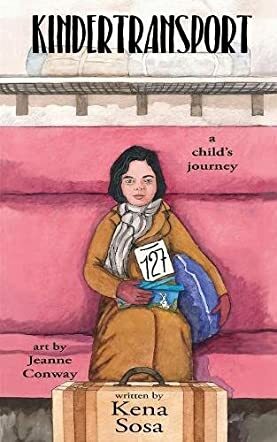 In Kena Sosa’s tale through the eyes of a German Jew, we read the thoughts of the innocent in Kindertransport: A Child’s Journey. As an adult educated in Holocaust history, I found this story chilling. Aided by delicate drawings by Jeanne Conway, the story will rest easier with a younger audience, but not without leaving a sense of urgency in the reader to learn more. As a former teacher, I taught a unit on this time period in literature for thirty-three years. The Diary of Anne Frank and Night were always my standard literary resources, but I believe Kindertransport could definitely be included in the curriculum as a middle grade addition. Sosa creates the perfect balance in middle grade language and storytelling to create a vivid rendering for the young reader. The inclusion of vocabulary and language resources help to make this a valuable curriculum addition for the classroom. This is told factually, after research by Kena Sosa, yet it can be understood with empathy by the new generation of youngsters, and an understanding that , unfortunately, something similar can happen if we do not take care .